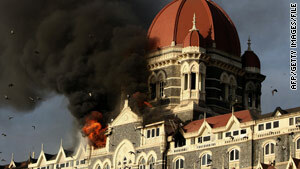 The November 2008 terror attacks in Mumbai, India, which included the siege at the Taj Mahal hotel, killed 160 people. Chicago, Illinois (CNN) -- David Headley -- the Chicago, Illinois, man accused of involvement in terror plots in India and Denmark -- pleaded not guilty Wednesday to all 12 counts against him. Headley, 49, faces charges of helping to plan the November 2008 terrorists attacks in Mumbai, India, which killed 160 people, as well as further attacks against a Danish newspaper, which were not carried out. He entered the court in an orange jumpsuit and leg chains but no handcuffs and appeared relaxed and aware of the proceedings. He was clean-shaven with short hair. Headley was arrested at Chicago's O'Hare Airport on October 3 and charged in the alleged Danish plot. The Justice Department added the Mumbai charges this week. At the time of his arrest, Headley was on his way back to India to plan a second attack, a source close to the investigation said. Headley faces six counts of conspiracy to bomb locations in India and to murder and maim persons in India and Denmark and six counts of aiding and abetting the murder of U.S. citizens in India, the Justice Department said Monday. He has agreed to cooperate with authorities investigating both terror plots, the Justice Department said. Headley's lawyer did not dispute that. "These are very serious charges" against my client, his lawyer, John T. Theis, said outside the court Wednesday. Government lawyers said they would not comment Wednesday. Abdur Rehman Hashim Syed, a retired major in the Pakistani military, was also charged with conspiracy in planning to attack the Danish newspaper. So was Tahawwur Hussain Rana, whom U.S. authorities identify as a Pakistani native and Canadian citizen who lives mainly in Chicago. Headley said he worked for First World Immigration Services, a company owned by Rana, though authorities have said in court papers that surveillance showed that he "performs few services" for the company. Kia Scherr, whose husband Alan and 13-year-old daughter Naomi were killed in the Mumbai attacks, welcomed the developments in the case. "Though my loss still causes me much grief, I am grateful for the support of the FBI, who called me personally and informed me of the news," she said in a statement Tuesday. "My hope is that Headley cooperates fully and discloses all information to aid in the investigation." He waived his right to have any further counts brought in front of a grand jury. His next court date will be January 12, 2010, for a status hearing, U.S. district Judge Harry D. Leinenweber ruled. CNN's Robert Howell in Chicago contributed to this report.